90% of International traffic landed there from 1948 onwards, and to this day). 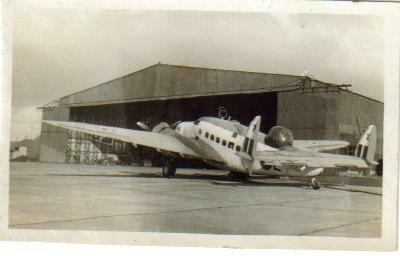 assessment of some of the unique pictures found on the Pearce Family album. cellars and just remain to be discovered for what they really are. Got a comment or info to share with Eggert and I on this subject? Click on pictures to view individually in new window. Click back button to return to this page. 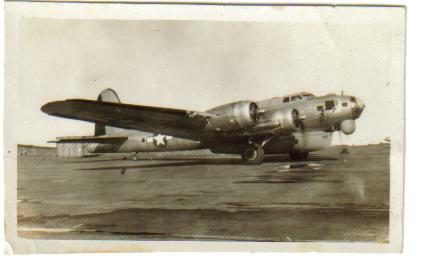 American Boeing B-17H Flying Fortress with rescue boat, this likely taken at Keflavik Airport, two of them were there at any time in 1945 to 1950.
and Reykjavik in November and December 1945 - carrying Mail for the ´HR´ (Royal Mail / Postal Service) ~ Home Run. 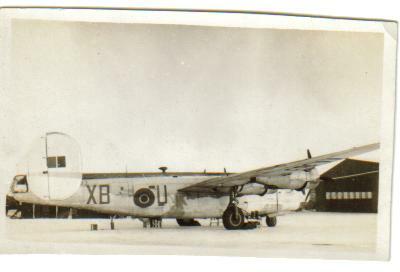 RAF Percival Proctor (serial HM289 "C") of Station Flight Reykjavik (1942-1946) but was sold in Iceland and became TF-SHA. 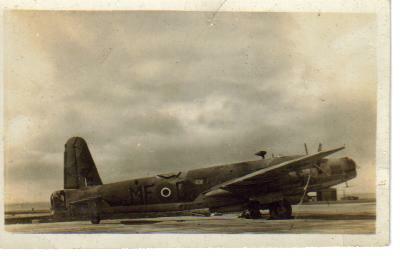 RAF Avro Lancaster ME374 V7-A of unknown unit (Possibly EANS - Empire Air Navigation School) known visiting in spring 1946. 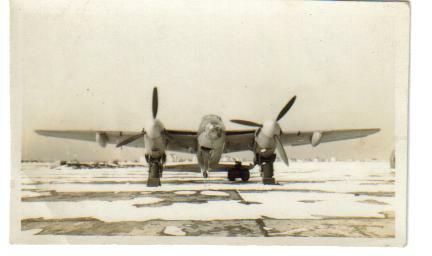 RAF deHavilland Mosquito of ferry flight to UK from Canada 1946 (likely just one via Reykjavik in all of 1946!) but year could be 1945 and could then be any serial. It just does not show. 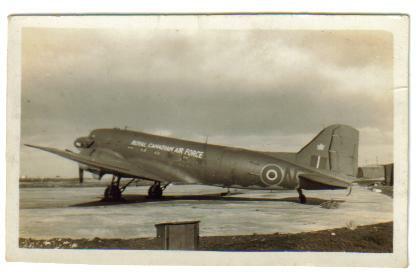 RAF Lockheed Hudson (likely FK807) "E" of Station Flight Reykjavik (sold as TF-SHB in 1946, crashed 1950). 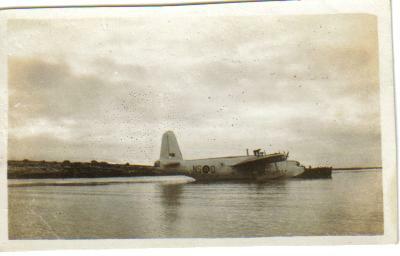 RAF Vickers Warwick of 280 (ASR) Squadron with lifeboat, Reykjavik 1946 (temporary detachment). 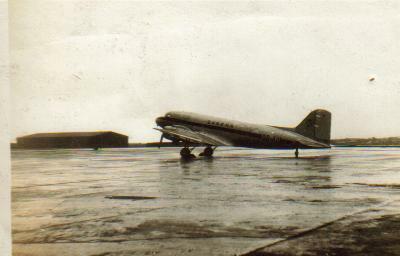 Douglas DC-3 of SABENA, at Reykjavik Airport, on ferry flight to Belgium (April or May 1946). on the north side, they landed at Skerjafjorður / Reykjavik Seadrome! but usually moored at Fossvogur). 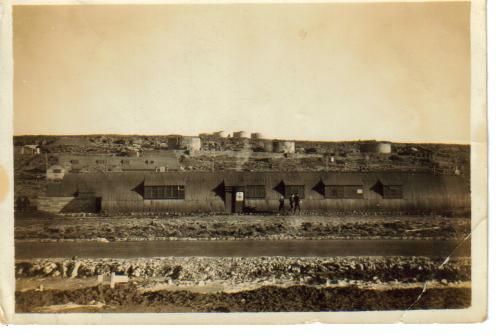 Barracks and fuel storage tanks on west side of Öskjuhlið, hot water tanks at top of hill. Larger tanks are there now with dome Perlan on top. 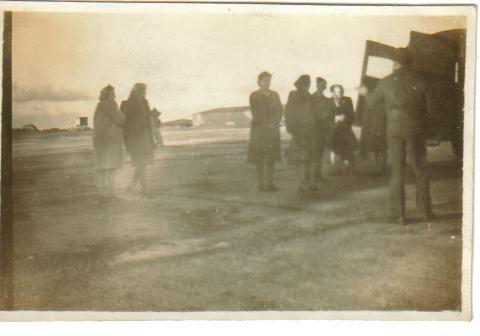 Women and Raf personnel at Reykjavik Airport, Hangar (no.4) across the ramp/runway. 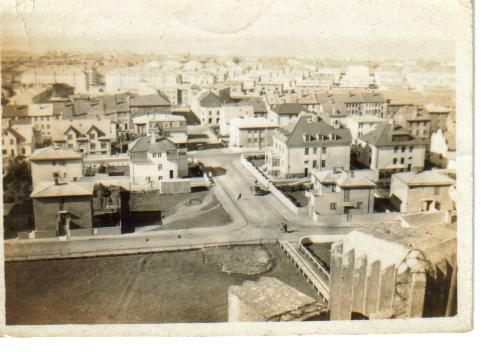 Buskerbrian says: It is very likely my father and mother are in this photo. 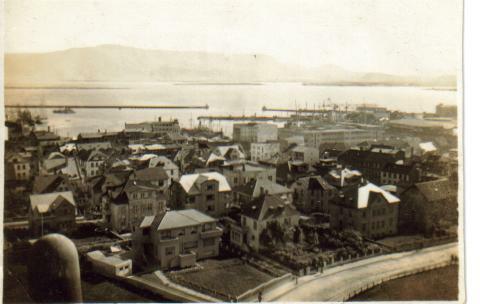 Perhaps it was taken the same day as the Hafnarfjordur photo (below). 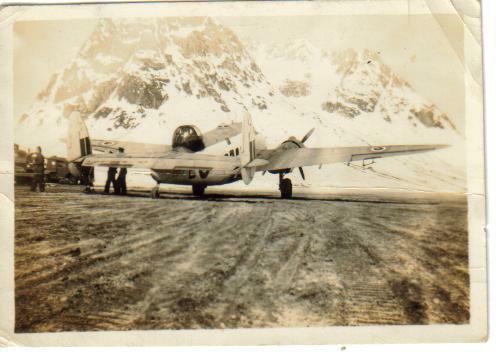 RAF Lockheed Hudson (FK807 "E" Station Flight) at (American forces built) Ikaeq Airfield, East-Greenland, May 1946 (one visit known - purpose probably mail or ambulance flight . 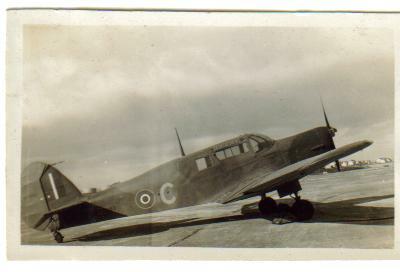 280 Squadron formed on 10 December 1941 at Thorney Island for air-sea rescue duties. 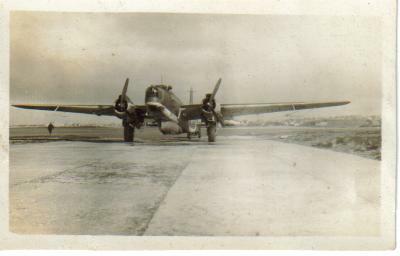 Hudsons were required for other units. 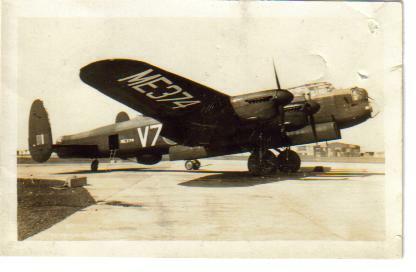 In June the Squadron began taking part in searches along the coasts of south-east England and East Anglia. 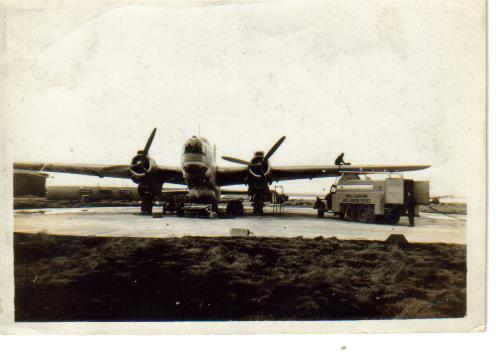 detachments to Cornwall, Northern Ireland, the North of Scotland and Iceland, being disbanded on 21 June 1946. 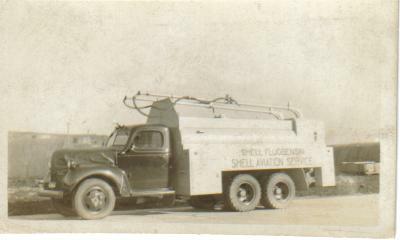 "Shell" fuel-truck (make and model not known - appears as ´Chevrolet´ but is American type). Reykjavik Harbour looking east-north-east from Catholic Church tower (Landakotskirkja) with Mt. Esja in distance. Picture 017: Looking north-west from top of Catholic Church tower (Landakotskirkja). 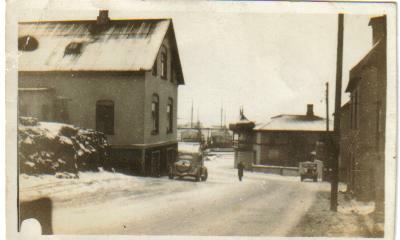 Reykjavik-Road, Hafnarfjordur - one of the houses was an ´Hotel Cellar´ (restaurant/bar/dance-hall), but house in right middle distance is long gone. you had many great nights courting your future wife would make this photo special indeed. 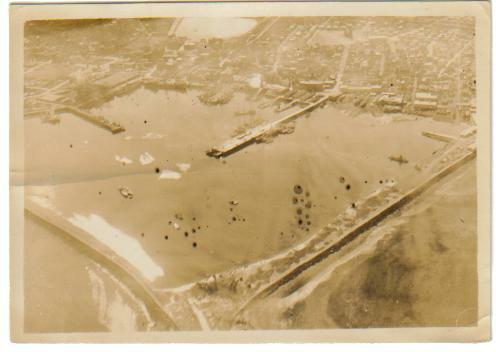 Aerial view of Reykjavik harbour, the Pond at top.